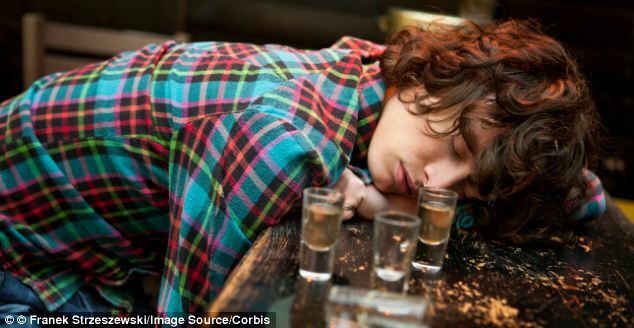 Drunks should be banned from being treated in A&E because becoming intoxicated ‘is no accident’, say senior nurses. They say those under the influence of alcohol are clogging up casualty departments every day, not just on Friday and Saturdays, diverting from care for the elderly and other seriously ill patients. Nurses are calling for permanent ‘drunk tanks’ – special units in city centres or hospitals where people can sober up – to be piloted across the country. Last year more than a million patients were admitted to hospital for alcohol-related illnesses or injuries, double the number in 2002/3. Dr Peter Carter, chief executive and general secretary of the Royal College of Nursing, said drunk tanks should be trialled in certain areas of the country equipped with scans and highly trained staff to check patients have not suffered life-threatening head injuries. ‘They say there was a time when this was a Friday or Saturday phenomenon but it’s now round-the-week,’ he said. Speaking at the RCN’s annual conference in Liverpool, he added: ‘It’s a contemporary problem, more and more people – not just young people, people of all ages, are drinking too much. District nurses will be ‘extinct’ by 2025, according to the Royal College of Nursing. NHS figures show that there are now 6,656 district nurses, who care for the elderly at home or administer medicine, compared to 12,620 in 2003. ‘There is no doubt the country has a significant problem. ‘We now have the highest rates of liver disease and alcohol-related illnesses such as type 2 diabetes and oesophageal problems. ‘People that come in inebriated require a lot of nursing care and that detracts from nurses being able to care for others. The NHS now spends £3.5billion a year treating patients for the effects of alcohol, more than twice as much as in 2001 when it was just £1.47billion. Uwem Otong, from the south east Northern Ireland branch of the RCN, said: ‘Alcohol intoxication is not an accident. ‘At a time in which the NHS is facing financial burden, it is important that services are channelled properly. Some areas have introduced drunk tanks on a temporary basis, including Bristol, where one was set up from a building in the city centre over Christmas and New Year. But Dr Carter called for other areas to pilot similar projects over longer periods of time. Anthony McGeown, a member of the union’s Greater Glasgow branch said: ‘Accident and emergency departments up and down the country are caring for more patients than ever before. ‘The drunk tank concept are cells which are used so that those who are intoxicated can sober up without the need for being arrested or for hospital care. The NHS does not collect figures on those attending A&E because of alcohol, it only records how many are later admitted to wards. But the charity Alcohol Concern has estimated drunks are responsible for a third of all attendances – rising to 40 per cent at the weekend and 70 per cent in the early hours.